The rondel (or roundel) dagger was *the* typical sidearm of the 14th and 15th centuries, and was carried by a wide section of the populace - from tradesmen to fully-armoured knights. This reproduction of a dagger in the Wallace Collection (A.726) is from the mid 15th century and features a sharp T-backed single edged blade crafted in 5160 high-carbon steel peened through a hardwood grip. The tip of the blade is reinforced for extra "oomph" when inserting through armor lames or helmet eyeslots. 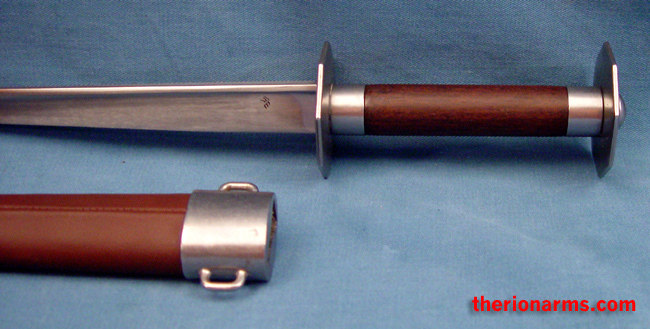 Beautifully constructed with steel fittings and a leather-covered wooden sheath that complements the dagger perfectly. Studying Fiore or Talhoffer? This is the dagger for you. interior grip length: 4 1/8"